Goodreads says, "Jonah never thought a girl like Vivi would come along. Vivi didn’t know Jonah would light up her world. Neither of them expected a summer like this…a summer that would rewrite their futures. In an unflinching story about new love, old wounds, and forces beyond our control, two teens find that when you collide with the right person at just the right time, it will change you forever." Vivi is a charismatic girl; the kind of girl who radiates sunshine when she walks into a room. She loves vintage clothing, bright red lipstick and knock-off Marilyn Monroe hair. Vivi and her mother are spending the summer in Verona Beach, California and she meets townie and chef-wannabe Jonah. Jonah is a complex guy and has more responsibilities than your average seventeen year old. His father tragically died and left behind his mother and many siblings in a state of disarray. You see Jonah's mother never really got out of bed and fully recovered from the shock of her husband's death. Instead she left all the responsibilities to her older children, including Jonah. When Vivi meets Jonah, sparks fly and he can't help but question why such a vivacious girl would be attracted to him. Meanwhile, Vivi loves Jonah's family and even helps him deal with the ups and downs of his mother's depression. A summer romance ensues...that is until Vivi stops taking her medication and starts to act unpredictably. This obviously impacts their relationship and quickly it becomes a summer romance that either of them will ever forget. Emery Lord's serious and beautifully written novel, When We Collided, had me feeling it all for these two characters. In the end, the book ultimately made me think, which all great books do. Vivi felt larger than life in When We Collided. It took me awhile to warm up to her, because she was so out there at times. She was definitely a force to be reckon with and one of those characters that you slowly gravitate towards. Some of the things she would say seemed so outlandish, but I realized what she was saying was sort of beautiful in a messy kind of way. I realized she suffered from a mental illness of some sort and readers will slowly piece together the puzzle surrounding this as the story progresses. As Vivi would throw her medication in the ocean, my heart would break, because I knew it would impact her relationship with Jonah. Jonah is such a great guy in When We Collided. I'm pretty sure high school me would have LOVED him and declared him my new literary boyfriend. He is such a responsible guy, loyal, friendly, caring...the whole nine yards. And to top it off, he makes the most incredible food. He's pretty much the perfect high school boyfriend. But his life isn't perfect. As I mentioned before his mother suffers from severe depression and has pretty much given up. It's up to Jonah to take care of his younger siblings, which is no easy task. It broke my heart. Their relationship in When We Collided was so much more than a summer romance. It was, like Vivi, larger than life and even when it was going downhill, I still held out hope that these two would work it out. But we all know that summer romances are usually fleeting, especially when dealing with the aftermath of Vivi's choices. Their relationship reminded me a big of Mad Love (I'm sure this reference is showing my age!) for those who are familiar with the movie. Ultimately, both characters had some issues and I just wanted them to find their way...to be happy. 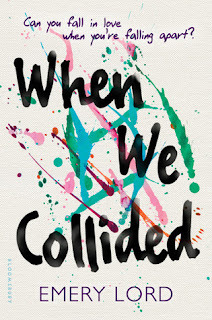 If you are looking for a smart read this spring that is equal parts serious and romantic, but will also make you think, then check out When We Collided. I know it had me thinking about the importance of mental health and I applaud Lord for writing about such a tough topic. When We Collided is one of my favorite books of the year. I just got this from the library and I admit I'm nervous that I won't like it. Finding out that it is one of your favorite books of 2016 makes me feel better about it! Great review! I think you'll like it, Christina. It's a bit different than her other books though. Thanks for visiting! Yes, definitely not just a romance. It's a smart read. I think you'll like it, Joy! Thanks for visiting! I was really excited about this one Christina, and then I of course cheated and read the end first and lost some of my enthusiasm. I know the end is realistic and very fitting and true to this story, but I can't help the romantic in me that wants something different! I still might give it a go though. I so love Emery Lord! haha. I know what you mean! I think you definitely should give it a try! Her writing is fantastic. Thanks for visiting, Jenny! I loved this one too. So well written! I agree. Lord is such a great writer. There were so many quote-worthy lines. Thanks for visiting! I am glad you enjoyed this one, too.